The education rally at the state Capitol today should draw thousands of educators and their supporters, but they probably won’t get a warm welcome from most Republican officials. The rally begins at 12:30 p.m. on the south side of the state Capitol building. It’s impossible to avoid the reality. Republicans dominate state government. They hold massive majorities in both the House and Senate, the governor’s seat, and ALL statewide offices. Schools Superintendent Joy Hofmeister, a Republican, will be at the rally and speak in favor of raises for teachers, and some Republican lawmakers might support increased funding for education, but overall the GOP has created a drastic, emergency situation for our schools. The rally, called the Brighter Future, is designed to call attention to extremely low teacher pay here, an increasing teacher shortage in the state and a 24 percent decrease in Oklahoma education funding since 2008, the most in the nation. It’s a dismal situation that has the potential to get even worse. 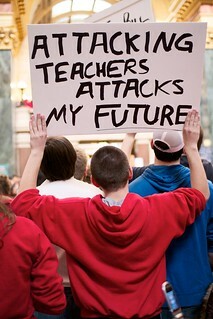 At this point, however, educators might just be happy if they don’t face any more cuts. The state faces a $611 million shortfall at least partially because of relatively recent income tax cuts and tax incentives given to businesses, including the state’s oil and gas industry. What doesn’t get stated enough or loudly enough at these rallies is this: (1) The cuts to education are part of a Republican agenda, along with high-stakes testing, to dismantle public education and privatize it, and (2) if voters here continue to elect Republicans in massive numbers education funding will remain inadequate in Oklahoma. A rally won’t change those facts. The larger point here is that although education funding should be a bipartisan issue, it definitely isn’t when it comes to the Oklahoma legislature and Gov. Mary Fallin. Fallin and conservative legislators may seem to sympathize with educators at times, but cuts to education here and elsewhere have been a part of the Republican agenda for a long time now. Rallies are great. They show solidarity, and leave participants energized, but the real change comes in elections. « What Ceremony Is Needed To Complete American Indian Museum?